Not to be confused with Michael Brecher. 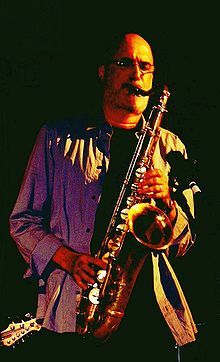 Michael Leonard Brecker (March 29, 1949 – January 13, 2007) was an American jazz saxophonist and composer. He was awarded 15 Grammy Awards as both performer and composer. He was awarded an Honorary Doctorate from Berklee College of Music in 2004, and was inducted into the Down Beat Jazz Hall of Fame in 2007. Michael Brecker in July 2004, performing during the "Jazz for Kerry" benefit concert in Manhattan. Michael Brecker was born in Philadelphia and raised in Cheltenham Township, a local suburb. His father Bob (Bobby) was a lawyer who played jazz piano and his mother Sylvia was a portrait artist. 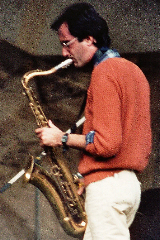 Michael Brecker was exposed to jazz at an early age by his father. He grew up as part of the generation of jazz musicians who saw rock music not as the enemy but as a viable musical option. Brecker began studying clarinet at age 6, then moved to alto saxophone in eighth grade, settling on the tenor saxophone as his primary instrument in his sophomore year. He graduated from Cheltenham High School in 1967 and spent that summer at the Berklee College of Music in Boston. After a year at Indiana University he moved to New York City in 1969, where he carved out a niche for himself as a dynamic and exciting jazz soloist. He first made his mark at age 20 as a member of the jazz-rock band Dreams–a band that included his older brother, trumpeter Randy Brecker, trombonist Barry Rogers, drummer Billy Cobham, keyboardist Jeff Kent and bassist Doug Lubahn. Dreams was short-lived, lasting only from 1969 through 1972, but Miles Davis was seen at some gigs prior to his recording Jack Johnson. Most of Brecker's early work is marked by an approach informed as much by rock guitar as by R&B saxophone. After Dreams, he worked with Horace Silver and then Billy Cobham before once again teaming up with his brother Randy to form the Brecker Brothers. The band followed jazz-rock trends of the time, but with more attention to structured arrangements, a heavier backbeat, and a stronger rock influence. The band stayed together from 1975 to 1982, with consistent success and musicality. Brecker was in great demand as a soloist and sideman. He performed with bands whose styles ranged from mainstream jazz to mainstream rock. Altogether, he appeared on over 700 albums, either as a band member or a guest soloist. He put his stamp on numerous pop and rock recordings as a soloist. His featured guest solos with James Taylor and Paul Simon are excellent examples of that strand of his work. For example, on Taylor's 1972 album, One Man Dog, Brecker's solo on the track "Don't Let Me Be Lonely Tonight" complements the other acoustic instruments and sparse vocal. On Simon's 1975 album Still Crazy After All These Years, Brecker's solo on the title track is used to a similar effect. His solos are often placed in the bridge, or appended as a rideout coda. Such a combination of musical structure and instrumentation typifies (and to some extent defines) this jazz-rock fusion style. Other notable jazz and rock collaborations included work with Steely Dan, Lou Reed, Donald Fagen, Dire Straits, Joni Mitchell, Eric Clapton, Billy Joel, John Lennon, Aerosmith, Dan Fogelberg, Frank Sinatra, Frank Zappa, Bruce Springsteen, Roger Daltrey, Parliament-Funkadelic, Cameo, Yoko Ono, Todd Rundgren, Chaka Khan, Orleans, Blue Öyster Cult, The Manhattan Transfer, Average White Band, Players Association, Paul Simon, James Taylor, Everything but the Girl, Patti Austin, Art Garfunkel, Carly Simon, The Brothers Johnson, and Karen Carpenter. Brecker also recorded or performed with leading jazz figures during his era, including Herbie Hancock, Chick Corea, Chet Baker, Jan Akkerman, George Benson, Quincy Jones, Charles Mingus, Jaco Pastorius, McCoy Tyner, Pat Metheny, Elvin Jones, Claus Ogerman, Billy Cobham, Horace Silver, Mike Stern, Mike Mainieri, Steps Ahead, Dave Holland, Joey Calderazzo, Kenny Kirkland, Bob James, Grant Green, Don Cherry, Hubert Laws, Don Alias, Larry Goldings, Bob Mintzer, Gary Burton, Yusef Lateef, Steve Gadd, Dave Brubeck, Charlie Haden, John Abercrombie, Vince Mendoza, Roy Hargrove and Spyro Gyra. Brecker played tenor saxophone on two Billy Joel albums. In 1983, Brecker played on three tracks on the album An Innocent Man ("Careless Talk", "Tell Her About It" and "Keeping The Faith"). In 1986, he played on "Big Man on Mulberry Street" on the album The Bridge. During the early 1980s, he was also a member of NBC's Saturday Night Live Band. Brecker can be seen in the background sporting sunglasses during Eddie Murphy's James Brown parody. After a stint co-leading the all-star group Steps Ahead with Mike Mainieri, Brecker recorded a solo album in 1987. That eponymously titled debut album marked his return to a more traditional jazz setting, highlighting his compositional talents and featuring the EWI (Electronic Wind Instrument), which Brecker had previously played with Steps Ahead. In 1987 he featured his new solo album at the JVC Newport Jazz Festival, incorporating the EWI. Brecker continued to record albums as a leader throughout the 1990s and 2000s, winning multiple Grammy Awards. His solo and group tours consistently sold out top jazz venues in major cities worldwide. He went on tour in 2001 with a collaborative group, Hancock-Brecker-Hargrove. This tour was dedicated to jazz pioneers John Coltrane and Miles Davis. Brecker paid homage to Coltrane by performing Coltrane's signature piece, "Naima". The composition is a definitive work for tenor sax; its demanding solo enabled Brecker to show his complete mastery of the instrument. The concert CD from the tour, Directions in Music: Live At Massey Hall (2002), won a Grammy in 2003. While performing at the Mount Fuji Jazz Festival in 2004, Brecker experienced a sharp pain in his back. Shortly thereafter in 2005, he was diagnosed with the blood disorder myelodysplastic syndrome (MDS). Despite a widely publicized worldwide search, Brecker was unable to find a matching stem cell donor. In late 2005, he was the recipient of an experimental partial matching stem cell transplant. By late 2006, he appeared to be recovering, but the treatment proved not to be a cure. He made his final public performance on June 23, 2006, playing with Hancock at Carnegie Hall. Brecker died from complications of leukemia in New York City. His funeral was held on January 15, 2007 in Hastings-on-Hudson, New York. On February 11, 2007, Brecker was awarded two posthumous Grammy awards for his involvement on his brother Randy's 2005 album Some Skunk Funk. On May 22, 2007, his final recording, Pilgrimage, was released and received a good critical response. It was recorded in August 2006 with Pat Metheny on guitar, John Patitucci on bass, Jack DeJohnette on drums and Herbie Hancock and Brad Mehldau on piano. Brecker was critically ill when it was recorded, but the other musicians involved praised the standard of his musicianship. Brecker was again posthumously awarded two additional Grammy Awards for this album in the categories of Best Jazz Instrumental Solo and Best Jazz Instrumental Album, Individual or Group, bringing his Grammy total to 15. Brecker's search in the International Bone Marrow Registry for a match prompted his wife and manager to organize a series of bone marrow drives throughout the world, including the Red Sea, Monterey, and Newport Jazz Festivals. Brecker was subsequently featured in a film directed by Noah Hutton (son of Debra Winger and Timothy Hutton), named More to Live For. It documents Brecker's battle with leukemia, and the production of his final recording. By going public with his illness, Brecker raised tens of thousands of dollars for testing, and signed up many thousands of donors, but was unable to find a match for himself. Herbie Hancock said that around nine months before his death, Brecker had started practicing Buddhism and three months later joined Soka Gakkai International, a group associated with Nichiren Buddhism. At Brecker's memorial service, Hancock, Wayne Shorter and Buster Williams (who all practice the same form of Buddhism) as well as Brecker's son, Sam, sat in a line with their backs to the audience while facing an inscribed scroll (Gohonzon) hanging in a wooden shrine (Butsudan) and chanted, "Nam myoho renge kyo" for five minutes. Brecker's widow Susan organized two benefit concerts, the first in 2015 and the latter in 2017. The events were dubbed "The Nearness of You" concert and were held at Jazz at Lincoln Center's Appel Room. The concerts aimed to support cancer research at Columbia University Medical Center (CUMC) and the work of doctors Azra Raza and Siddhartha Mukherjee. Guest performers included James Taylor, Paul Simon, Chaka Khan, Randy Brecker, Dianne Reeves, Bobby McFerrin, Diana Krall, Wynton Marsalis, Will Lee, Gil Goldstein, Antonio Sanchez, John Patitucci, Adam Rogers, Mike Mainieri, Andy Snitzer, Jack DeJohnette, Chase Baird, Jeff "Tain" Watts, Robert Glasper, Dave Liebman, Joe Lovano, Ravi Coltrane, Nir Felder, Eli Degibri and others. 1986 A House Full of Love – Grover Washington Jr.
^ "Michael Brecker 3/29/49 – 1/13/07 | Dusty Wright's Culture Catch". Culturecatch.com. 2007-01-16. Retrieved 2012-06-25. ^ "Directions In Music – Michael Brecker/ Herbie Hancock/ Roy Hargrove | Jazzbo Notes". Webcache.googleusercontent.com. 2012-06-09. Archived from the original on 2012-11-20. Retrieved 2012-06-25. ^ Small, Mark. "Saxophonist Michael Brecker—11-Time Grammy Winner, Session Player with Jazz and Pop Legends—to Welcome Entering Class, Accept Honorary Doctorate at Berklee College of Music Fall Convocation". Archived from the original on 10 September 2006. Retrieved 22 August 2012. ^ "In Memorium – MICHAEL BRECKER – Jazz-Rock Artists". Jazz-rock.com. Retrieved 2012-06-25. ^ "John Robert Brown". John-robert-brown.com. Retrieved 12 July 2017. ^ "Will the Real Michael Brecker's Sax Mouthpiece Please Stand Up". Neffmusic.com. Retrieved 12 July 2017. ^ Kilgannon, Corey (June 2, 2007). "'&#39New York Times'' "A Jazzman's Farewell Album, All Heart and Soul" June 2, 2007". Nytimes.com. Retrieved 2012-06-25. ^ Ratliff, Ben (February 22, 2007). "Celebrating a Saxophonist's Art and Heart". The New York Times. ^ Panken, Ted. "Colleagues, Collaborators Remember Michael Brecker in NYC Concert" (HMTL). Downbeat Magazine. Retrieved 2018-03-13. ^ "James Taylor & Paul Simon Play Benefit for Late Jazz Great Michael Brecker" (HMTL). Billboard. Retrieved 2018-03-13. ^ Farberman, Brad. "Concert Review: "The Nearness of You" at Jazz at Lincoln Center" (HMTL). Jazztimes. Retrieved 2018-03-13. ^ "VIEW DVD Listing". View.com. Retrieved 2012-06-25.